Softball was the usual game of the Brookside staff. 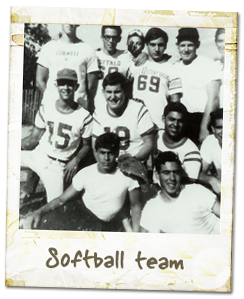 Most summers, starting when I was about 13 or 14 softball was the activity of choice during the day for the staff working at the hotel. This was serious business, with people trying out for the team, specific positions, and regular games between the staff and guests on weekends, other hotel staff teams during the week, and special games with the bungalow people around the area when the husbands were up for the weekends. I remember my brother Barry, Jeff Birenbaum, my grandparents upstairs tenant’s son in Brooklyn who also worked at the hotel, Jerry Levy and the older staff playing even before I could play on the team. But when I got old enough I started playing in the outfield [right field as usual where all the younger and mediocre players do and slowly moved up to first base. Being lefty I was limited in the positions I could play, no other infield position or catching. Although one summer I did play a few games at shortstop, trying to become the first lefty in the world to be able to stop a ground ball to the right into the hole between second and third base, spin completely around and still be able to throw the hitter out at first. I was in denial, and after a few games it became apparent why there were no professional left handed shortstops. Back to first base I went. Anyway, we had a core group of players, Lew Sims, Hal Lesser, both who pitched and played shortstop. It was my first experience with fast pitch softball, both of them were amazing, snapping off pitches from their hips that baffled most batters, Gerry Bogartz in the outfield with a rifle-like throwing arm, Toby Lovenger one of our power hitters, with the likes of David Sims, Michael Denkenson and Mitch Kittenplan completing the regulars. We filled in each season with new dining room staff but this was our core group when I was playing. Each year Lew and Hal scheduled games with the hotels like the Granite, our arch rivals, and Hal’s fathers bungalow colony. If there was a game scheduled we would quickly clean up the dining room after lunch. It was the only time people worked that quickly. We would play on a open field in front of our house, some grass, mostly weeds and trees in center field. A long ball to right field would end up in our neighbor’s field. That would be Levi, and he is another story altogether, a hermit living without electricity and and outdoor pump for water. We had bases, a few balls and bats, and that was the extent of our equipment. If we were playing an away game at another hotel or bungalow colony, a caravan would develop with players, guests and anyone interested in watching the game. Each game was taken very seriously by each side, but no matter the outcome we had fun. Although, I have to admit, we were pretty good! I also still have the”official” scorebook from one of those summers, with all the “official” boxscores! Talk ncredible about memories. My wife and I moved to Florida a couple of years ago. I’d love to hear from everyone. Glad that Mitch found the site…..one by one it seems that people are stumbling onto the Brookside….hope that everyone is enjoying the memories…..let me know if there is anything else we can add that would be fun.